The serving dish that's brought to our table resembles a cooking vessel, a deep pot made of hammered copper with a rounded bottom and looped brass handles. As our waitress sets the pot into a metal frame over a warming candle, exotic spices waft up on the steam rising from its contents. Peering inside, we see the fragrant source: an intensely colorful mosaic of freshly cut okra, diced bell peppers, onions and tomato in a thick sauce as ruddy and burnished as the pot that contains it. That pot, as it turns out, is a miniature replica of the kadhai, an Indian wok that is the restaurant's namesake. Kadhai is also the name of a category of dishes that are cooked in this wok, in the same sense that, say, casseroles are cooked in a casserole dish. On this particular night, we are enjoying kadhai bindhi, one of eight variations on the dish that is the specialty of the house. On another evening, kadhai chicken is just as beguiling, featuring moist nuggets of boneless meat, peppers, onions and tomatoes in a moderately spicy sauce that, as far as I can tell, is the same as that in the okra version. Other kadhai variations feature mushrooms, cauliflower, paneer, shrimp, lamb and goat. 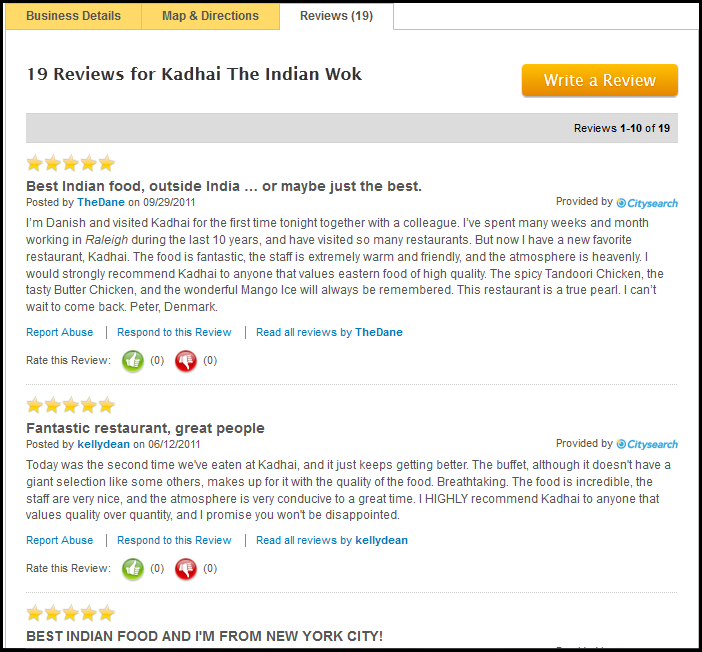 Distinctive as it is, kadhai (the dish) is hardly the only winning option at Kadhai (the restaurant). Baingan bharta, which the menu describes as "eggplant grilled over charcoal, mashed and cooked with fresh tomatoes, onions, garlic, ginger and spices," is every bit as deliciously complex as it sounds. Lamb patiala, which features lean, boneless lamb and potatoes in a masala-spiced sauce, is given a credible rendering. Shrimp vindaloo isn't as vinegar-pungent as most versions, but the spicing is hot as promised and the large butterflied shrimp are nicely cooked. At the other end of the flavor spectrum, butter chicken serves up tandoori chicken in a delicately spiced tomato cream sauce. Absent the sauce, however, tandoori dishes are not a strength at Kadhai, judging by the dry lamb tikka and only marginally better chicken tikka recently served as part of an assorted appetizer platter (whose portion, by the way, seems skimpy for the $10 price). The peas- and potatoes-filled samosa on that platter was fine, though, as were the mixed vegetable pakoras. Fortunately, both can be ordered à la carte from the appetizer list. But for my money, the most rewarding starter is chicken 65, a dish that gets its name from -- depending on which legend you choose to believe -- the year of its creation for soldiers in the Indian army (1965), the number of chiles called for in the original recipe or the number of days the chicken is marinated. Regardless, these moist, spice-reddened nuggets of deep-fried chicken are the perfect companions for a well-chilled glass of beer -- which will be available just as soon as Kadhai's alcohol permit is approved. In the meantime, a mango lassi isn't a bad substitute. Other than the kadhai dishes, the menu -- a modest but varied selection of mostly Northern Indian fare, divided roughly equally between vegetarian and non-vegetarian offerings -- contains few surprises. Or rather, it contained few surprises until recently, when the restaurant's owners, sisters Amita and Rupel Shah, hired a new chef: Eugene Gomes, who has cooked for more than 25 years in restaurants all over the world. Gomes has already begun spicing up the offerings with specialties such as lamb pasanda (a mild, cinnamon- and coriander-fragrant preparation that, according to Amita Shah, is a popular Indian dish in the U.K.); Indian-spiced shrimp puffs, offered as an appetizer special; and Mughlai masala fish, a dish that is said to have been served to the emperors of the Moghal empire. In comparison to such ambitious fare, the origins of kadhai dishes are humble indeed. 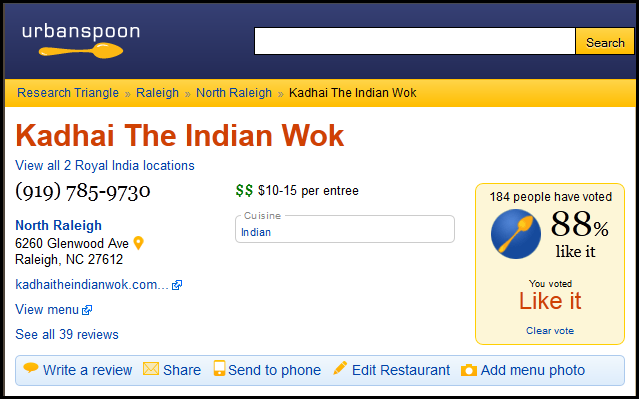 Even so, it's a safe bet that the hammered copper wok will retain its place of honor on the tables at Kadhai.